Google’s offering free versions of the programs designed to power Analytics 360. Below, I’ll go into detail about six new Google programs you should be using. Google’s had a big year. With the recent rollout of Google Analytics 360 and its subsequent programs, marketers have access to more analytics and detailed reports than ever. But of course, 360 comes with a hefty price tag. That’s why Google’s offering free versions of the programs designed to power Analytics 360. The new dashboards will give advertisers a consolidated, comprehensive overview of their account and how it’s performing. While something similar has been available on the home tab of AdWords, this new dashboard is unique in that it’s fully customizable – you choose (or even build) the KPI stats you want readily displayed. The original AdWords Home tab was just fine. It allowed users to customize different tables and charts into reports. It let them track important data in their Campaigns tab. But with new dashboards, Google’s outdone themselves. Now, there’s no need to compile and pull reports to find the exact data you need. Simply decide which metrics matter most to you, and customize your dashboard to reflect them. It’s a one-stop shop for all your ad tracking and performance measurements. And there’s no pre-determined list of metrics you choose from to display – with these dashboards advertisers can build their own charts or tables to include. The biggest benefit here is that your AdWords screen is no longer one size fits all. Log into your AdWords account, and you’ll see that Google’s already provided a starter dashboard. You can choose to keep it, modify as needed or build a new one from scratch. To create a new one, click Reports, select the Dashboards tab, and +Dashboard. For help, take a guided tour here. For more on how to build and use different dashboard functions, click here. Google’s answer to A/B (or split) testing arrived last year in beta form and is now readily available to marketers. Google Optimize is a tool that tests variations of your website. It allows users to quickly test page designs and content, and is fully integrated with Google Analytics. Due to this pairing with Analytics, you can more easily identify the best segments of users for testing. Optimize will automatically appear in your Google Analytics, and vice versa. While Optimize is free, Google does offer a paid version called Optimize 360, which adds on features like full multivariate testing and implementation services. To install Google Optimize to your site, you add a line of code to the Universal Analytics snippet installed on your site. Once installed, Optimize works with other Analytics functions to power more advanced targeting and reporting. It’s safe to say the majority of marketers are already using Google Analytics. It’s a great compilation of tools designed to cover everything from keyword research to website performance, and with the introduction of Optimize, it’s now extended to website testing. For marketers, that means access to more advanced targeting, conversion tracking, reporting, etc. It also allows you to test different experiment types such as A/B and redirect tests based on your site testing needs. And, using Analytics it allows you to choose which segment of your website visitors you would like to include in your experiment. Then, choose your account name and opt-in services. These include Improve Google products, Benchmarking, and in-depth analysis (Google recommends all of them). Add a container to your account, and you’re ready to go. Content performance: long form or short blocks on separate pages? 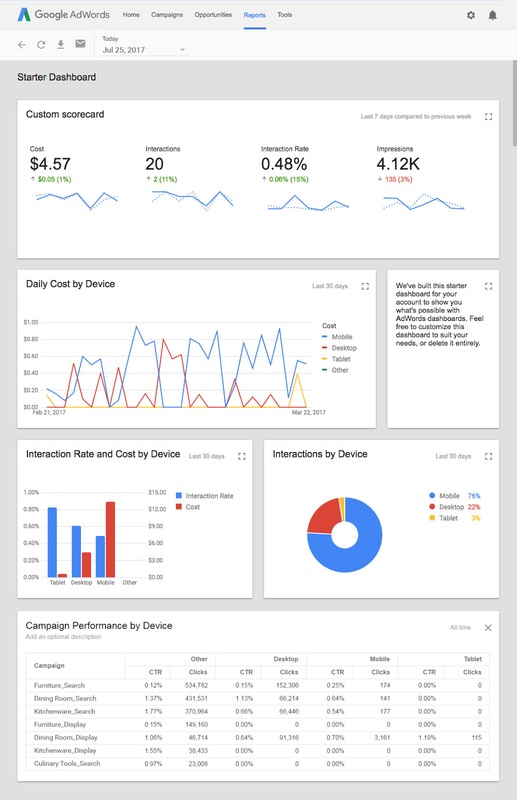 Google Data Studio is a new way to turn often complicated analytics reports into understandable, easy-to-read reports. In a nutshell, it’s a way to deliver data to your clients in a way that they’ll understand. Generally, marketers are charged with deciphering Google analytics reports and then presenting – and explaining – their findings to clients. As any marketer knows, this is easier said than done. Data Studio shines in its ability to visually present complex metrics and themes. It’s fully customizable, and you select how the data is presented – whether it be bar graphs, line graphs, charts, etc. Data Studio works by giving you the ability to pull all relevant data together into one report or dashboard. Combine data from Google Analytics, Google AdWords, YouTube, etc. The new platform even allows you to pull data from other sources – Facebook insights, etc. – into the same report for one comprehensive overview of all marketing activities. To pull information, all you have to do is import it into a Google Sheet. That means anything that can go in a Sheet – analytics from almost all marketing platforms – can go into your Data Studio reports. Overall, the new Studio will help you funnel down and deliver the most important metrics. Customizable. Start with a blank canvas, and drag and drop items where you want them. Choose how you want them to appear – bar or line graphs, scatterplots, geographic maps, etc. First, visit the Google Analytics Data Studio and click Sign up for Free. You’ll be taken a screen with dashboard examples and a “Welcome to Data Studio! (Start Here)” link, which will take you through a detailed tutorial. Just this year, Google released its free version of Attribution 360. Google Attribution is a tool that helps marketers identify each channel that played a part in a sale, and how much those channels contribute to overall ROI. The word attribution refers to customer’s interactions with different channels or events (touchpoints) that lead to the sale. Google Attribution uses machine-learning to measure the impact of each customer touchpoint. It pulls data already stored in Google Analytics, AdWords, and DoubleClick Search and integrated it so marketers can better understand their customer’s journeys, and where they stopped along the way. One of the tool’s biggest aims is to do away with last-click attribution – a strategy in which marketers only take the last customer touchpoint into consideration when attributing a sale. Instead, Google Attribution hopes to help marketers understand the impact of each channel – and how to strategize (and spend) accordingly. Enter in the Google Attribution homepage, and click the “Sign up for Free” button. Before using, make sure your Google Analytics is cleaned up. You want all ad reporting features enabled and all integrations (AdWords, etc.) working. Google Audience Center is a data management tool that collects key insights to help you better understand your customers. Basically, the new Audience Center gives companies and marketers a way to more strategically use customer data to target their ideal audiences. The new platform collects and organizes information from all data sources – analytics, email, CRM, etc., allowing you to make better optimize future efforts. Using those sources, you should ultimately be able to reach new, valuable audiences with the right messages at the right time, across all different channels. Like the others mentioned above, the platform ties in with Google DoubleClick and Adwords. This time, the data collected relates directly to your audience: when they use certain channels, what kind of content they’re reading, which ads they’re clicking on, etc. By putting all the needed numbers and stats in one place, marketers connect with customers on relevant channels. Google Audience has its own homepage where you can sign up or talk to someone in sales. Remember, for the Audience Center to work effectively you should first have any data cleaned up ready to go – from Google Analytics, DoubleClick, etc. With Offline Conversion Tracking, Google keeps tabs on all sales activity – whether it happens on or offline. Google’s Offline Conversion Tracking keeps a record of sales activity that takes place after an ad interaction. For example, if a customer saw and clicked on your AdWords ad, but later made the sale over the phone or in your office, Google would include that information as part of the conversion process. Offline tracking measures both conversions from clicks and conversions from calls. For clicks, AdWords will provide you with an ID for every click to your website that comes from an AdWords ad. When a customer later converts offline, you give the ID (GCLID) to AdWords, where it will keep a record. With calls, you keep track of which ads resulted in a sales call. Then, you import the information to Google, and it pairs the call with the affiliated ad. Help give you a broader, more accurate view of the entire sales process. Then, you’ll follow a two-part setup process: creating a conversion action in your AdWords, and configuring your site. For step-by-step directions, click here. All of the platforms above are designed to better track your analytics and ultimately improve your conversions. And at this price (free!) they’re certainly worth a try.